ADATA this week launched its Ultimate SU700-series SSDs that were briefly introduced at Computex 2016 about nine months ago. The new drives are based on 3D TLC NAND memory and are among the first retail products to use Maxiotek’s MK8115 controller for low-cost SSDs. The SU700 lineup will include various models with different capacities and performance. 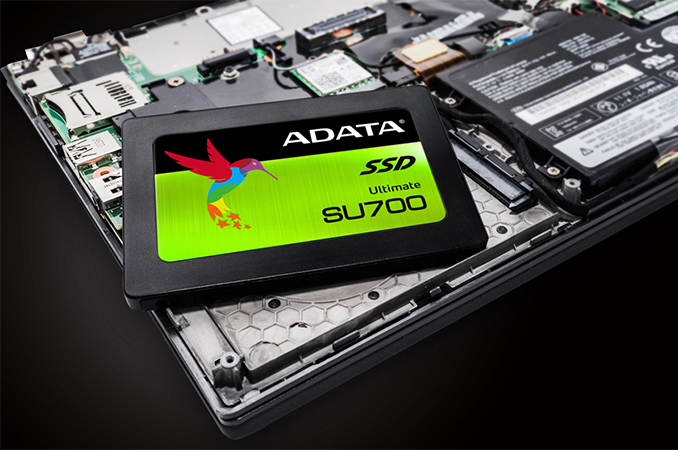 The ADATA Ultimate SU700 drives appear to be one the first retail SSDs featuring the MK8115 without onboard DRAM. The products use Micron’s 3D TLC NAND flash memory and come in 120 GB, 240 GB, 480 GB and 960 GB configurations. The drives come in a 2.5”/7 mm form-factor and use the SATA 6 Gbps interface, thus are compatible with modern desktops and notebooks. When it comes to on-the-box sequential performance, we are talking about a typical 2017 entry-level SATA SSD rated for a sequential read speed of up to 560 MB/s as well as sequential write speed of up to 520 MB/s when pseudo-SLC caching is used. Random read/write performance of the SU700 drives is almost on par that of ADATA’s Ultimate SU800 featuring the Silicon Motion SM2258 controller and the same 3D TLC memory - up to 80K read IOPS and up to 80K write IOPS (see the table for details). Keeping in mind that even the name of the new drives implies that they are positioned slightly below the SU800, it is not surprising that they are slightly slower as well. The SU700 drives (unlike the SU800) support hardware AES-256 encryption, however. Power Management Slumber, Device Sleep, etc. The manufacturer rates its SU700 SSDs for 2 million hours MTBF and ships them with a three-year limited warranty. From endurance point of view, 3D TLC NAND memory is more durable than TLC NAND produced using a thin planar process technology (as the cells in 3D TLC are larger, allowing more room for voltage drift over the life of the NAND). As with all SSDs, ADATA leaves NAND for overprovisioning in a bid to ensure that the drives work fine even after prolonged usage - however it remains to be seen how the use of a controller featuring a BCH-based ECC technology plays out for a TLC-based SSD in general. The Maxiotek MK8115 is a quad-channel NAND controller that supports SATA (technically SATA v3.2) as well as various types of SLC, MLC, 3D MLC, and 3D TLC NAND flash memory with Async, Toggle, and ONFi NAND interfaces (at up to 400 MT/s transfer rates). The MK8115 controller supports the developer’s AgileECC error correction (with programmable ECC parity that supports 1 KB code-word length correctable up to 76 bits, something that implies on BCH method) with virtual parity recovery. As with other controllers, the MK8115 supports modern security capabilities (AES-256, SM4, TCG-OPAL 2.0, IEEE1667) and other features, such as low-power modes (Slumber/Device Sleep, etc. ), advanced static/dynamic wear-leveling and so on. So while the MK8115 formally supports AES-256 encryption (something that is not always supported by inexpensive controllers), from an ECC point of view it seems to be behind competitors that also support LDPC. All that being said, one of the key features that Maxiotek advertises about its MK8115 is the fact that it does not require additional onboard DRAM, thus allowing saving a few cents on the SSD bill of materials. We're looking forward to when Billy gets a sample for review. ADATA had not announced MSRPs for the new drives. We understand that since the Ultimate SU700 family is positioned below the SU800 and SU900 series, it will be a bit cheaper, but we cannot share recommended prices just now. They could save more money simply reducing the size of 2.5" drives and make them more of a square (volume shipping costs down, more item at the same area). I guess that's fine if you need a low capacity SSD for a mobile system. Those of us with real full fledged computers however are interested in real capacity and capacity that can expand. In that scenario M.2 is useless. They keep releasing M.2 SSDs so I suppose somebody must be buying them I just can't figure out why unless it's for an ultra book or other small form factor laptop. As for space and airflow you can already mount 2.5" form factor SSDs in out of the way places such as flat against one side of a case. And if you are interested in M.2 then you aren't going to care much about capacity in the first place so you wouldn't have to be concerned with the ability to mount multiple 2.5" SSDs in such a case anyway. As for me I couldn't care less about how pretty it looks on the inside and certainly wouldn't want to cripple my options for expansion and performance improvements just to avoid having to plug something in with a cable. But to each their own. Who need all that now completely obsolete junk after Samsung made 3.5GB/s PCIe drives? M.2 SSDs probably are more suited for scenarios where there is space constraints, i.e. laptop/ Ultrabooks. I believe most desktop SSD users are still on 2.5 inch form factor as there are plenty of SATA 3 ports, as oppose to typically only 1 M.2 slot on the motherboard.